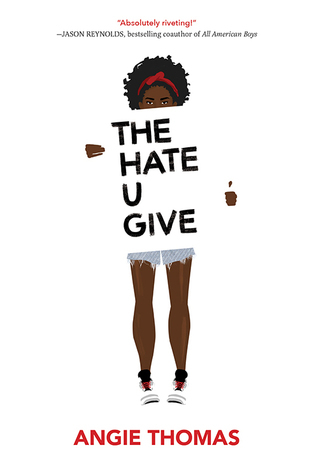 The Hate U Give is incredible, powerful, and an absolute must-read for everyone. Thomas's story begins with our heroine, Starr, witnessing the death of her childhood friend, Khalil, who is unarmed and shot by a white police officer. What ensues is chaos as Starr struggles to protect herself in the media and amongst the two worlds she straddles--her expensive private school where she is one of two black kids and the town where she grew up in which is overrun by gangs. Starr's story is a beautiful rendering of what it means to be black in America; of the microaggressions and racial comments you have to bite your tongue from responding to, of the pain and fear and injustice. I may not have been able to relate to the community Starr lived in, but so much of this story hit so close to home. One of Starr's closest friends continues to make "slight" racial comments/jokes in the wake of Khalil's death and Starr is fed up of ignoring them and moving on. She finally confronts their toxic friendship and as someone who is currently biting my tongue in the face of "slight" racist comments/jokes on a daily basis (being as I am currently studying abroad in Europe and my program is very, very white) I completely understood. But more than that, this is an incredible YA novel about family and growing up and finding yourself and what you believe in and what you're going to fight for. I especially loved the emphasis on family that this novel delved into, from Starr's parents to her uncle and even her brothers. I felt immersed in a loving African American family while reading this and I desperately want to go back. Thomas's writing is just that good, though--I cannot recommend this enough and I wish she had a backlog of twenty-five novels for me to comb through. I think, often in YA, we tend to have "issue" books or "diverse" books which seem to stand on their own from other novels. I don't want readers to think of this novel as one of those books. Is it diverse? Yes. Does it tackle important social issues? Absolutely. But at its core, it's an important story about belonging that I think everyone will be able to relate to and definitely learn from. In the wake of our election, I have been motivated to learn more now than ever before about what it means to live in America and have an experience different from my own. If you feel even a fraction of the anxiety and desire to create change that I have felt over these past few months, read this book. It'll make you feel as if you're on the right track, at the very least. I have this one and I hope to read it soon. I'm so glad that you loved it. I've pretty much only heard good things. It's definitely an important book in today's climate, but I like that it also focuses on family and standing up for oneself. I really want to read this one! I think this will definitely be a book I'll have on my classroom bookshelves and I can't wait to check this one out. Great review, Keertana! This story sounds like something I could be reading about in real life headlines. Sorry to hear you've suffered the same type of "jokes", Keertana! Lovely review! I so need to get this book. It has risen to be one of the top books I think I need to read. The fact that you feel so highly about it makes me want it even more. Brilly review! Loved your last paragraph and it sums up exactly the kind of book that I need right now. You are so right about the YA genre and I love that while this does have the typical YA feel it is something different and worth the read. Lovely review for this! So much feels for this book lately and for Angie Thomas as well. I've had this book on my shelf since before publication, I really need to read it. Great review, Keertana. I still need to read this book! It is on my never-ending TBR. I like what you said about "issue" books in YA - I'm glad to hear that this is so much more. It's easy to see why this is a multi-week NYT bestseller. :D Great review, Keertana!